The 20th century is marked by the industrial growth of all nations around the world. As a result the global energy demand is tremendously rising and most likely this will increase the threat of global warming. Mankind must therefore find a way to feed the energy hunger of the growing nations. As stated before, the German approach is to push the renewable energy sector by direct or indirect subsidies. The photovoltaic sector in particular is very highly subsidised. So far everything looked smoothly for the development of this plan. However, the last months have been dominated by press releases regarding German solar panel producers going bankrupt, like Solar Millennium, Solon, Solarhybrid and Q-Cells3. This development is raising the question: What has happened in the solar panel industry sector and what has lead to this development? To answer this question it is necessary to analyse “the macroenvironment” of this industry. With these analyses it is then possible to determine the driving and influencing factors and forces in this industry sector. The findings of the analyses will be used to evaluate the attractiveness of the German solar panel industry. Finally it should be possible to answer the question. 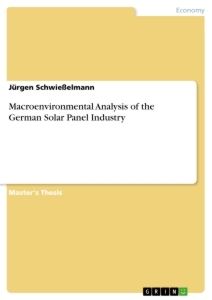 Therefore, to answer the main question of the thesis, the macroenvironment of the German solar panel industry needs to be analysed from the market point of view, covering the before described factors and forces. In detail a multi step approach will be used to answer the question and analyse the macroenvironment for the German solar panel industry. The analysis concept in this thesis will follow the basic approach of Michael Porter5 for structural analysis of industries and will be supplemented by the approach of Thomson / Strickland / Gamble6 for evaluating a company’s external environment. 1. What are the industry’s dominant economic features? 2. What kind of competitive forces are industry members facing and how strong is each force (Porter’s Five-Forces Model of Competition)? 3. What forces are driving industry changes and what impacts will they have on competitive intensity and industry profitability (Concept of Driving Forces)? 4. What market positions do industry rivals occupy - who is strongly positioned and who is not (Strategic Group Map)? 5. What strategic moves are rivals likely to make next? 6. What are the key factors for future competitive success (Core Concept: Key Success Factors)? 7. Does the outlook for the industry present the companies with sufficiently attractive prospects for profitability? In the second step the technical background of photovoltaic basics will be briefly presented to provide the needed understanding of the topic. After that introduction the analysis will be performed according to the setup done in the first step. In the last step the findings will be used to evaluate the attractiveness of the industry, to answer the main question and to draw a brief future outlook for the German market participants in this sector. Each of the following chapters is dealing with one of the before stated questions and will explain the approach and tools for the macroenvironmental analysis of the German solar panel market. 1. Competitive pressure coming form the rivalry among the competing sellers. 2. Competitive pressure related to the threat of new entrants in the market. 3. Competitive pressure associated from companies of other industries trying to offer substitute products. 4. Competitive pressure connected to the bargaining power of buyers. Step 1: Identify specific competitive pressure associated to each force. Step 2: Evaluation and graduation of the strength of each force (fierce, strong moderate to normal or weak). 1. High Number of equally balanced Rivals. With a high number of equally balanced rivals the probability of moves by one competitor is high. This may result in instability of the market, because the resources for counteractions are available. 2. Slow Growth of Industry. With slow growth rates in an industry competition, companies with expansion desires must aim at the market share. This usually means more intense competition than with high growth rates. With high growth rates every participant can improve its share. With low growth rates, at least one participant has to loose share (usually not voluntary or without a fight). 3. High Fixed or Storage Costs. In industries with high fixed costs the force to utilize the capacity fully is high for every company. In case of overcapacity, this leads automatically to a price drop. Similar is the situation where products must be stored for high costs or if storage is not easy (for instance fish or lobster). 4. Lack of Differentiation or Switching Costs. In industries where products are a commodity or nearly a commodity, the buyer decision is usually based on price and service. This leads commonly to intense price and service competition. 5. Huge Enlargement of Capacity. In some industries the enlargement of capacity can only be done in large scale (for example chemical industry, aluminium production). As a consequence, the balance of supply and demand is disturbed. This very often leads to waves of overcapacity and price drops. 6. Diverse Rivals. Many rivals in an industry with different origin, background, history, relations and goals tend to have more conflict than a industry with more equal rivals. Because of these differences, the companies sometimes misinterpret the intentions of the others and rules of business may not be found. Therefore the competition is more intense for the market participants. 7. High Strategic Stakes. The rivalry is more explosive in industries where rivals have high stakes in having success. For instance, a diversified rival is seeking success to every price in a special branch to meet corporate strategy. Such an expansive strategy can also take loss leaders into account (if resources are available). 1. Cutthroat or brutal Rivalry. Competition is characterized by heavy price wars or other aggressive tactics which is destructive to industry profitability. 2. Fierce or Strong Rivalry. The fight for market share is so intense, that the margin for most rivals is squeezed close to zero. 3. Moderate or Normal Rivalry. The level of competition allows most industry participants to earn sufficient profits. 1. Economic of Scale. This barrier refers to declining unit costs to increasing unit volume per period. This is a huge threat to the potential entry, because it forces the entry to high production volume and to powerful reactions of the existing companies or to low production volume and the related cost disadvantage. Economic of scale is present in almost every business function (production, R&D, distribution and so on). 2. Product Differentiation. Product Differentiation refers to the fact that the established companies have brand and buyer loyalty. This creates threat to the entry, because huge resources are needed to overcome this loyalty. These efforts usually lead to losses during the entry phase. 3. Capital Requirements. If large investments need to be taken to enter the new industry, a big entry barrier is created. Especially, if capital is needed for unrecoverable or risky tasks like an advertising campaign and R&D. 4. Switching Costs. Switching costs means one time cost for the buyers for changing the supplier. With high switching cost the new supplier needs to offer a better price or performance to get the buyers to switch. 5. Access to Distribution Channels. This factor can create an entry barrier. The new entry normally has to use the same channels as the established companies. Therefore the new company has to convince the channels to accept its product with enticements, for example lower prices (which again lowers the profit prospects). 6. Cost Disadvantages Independent of Scale. The established companies can have (sometimes unreachable) cost advantages over the new entrants. For instance: special and protected technology, better access to suppliers, subsidies by the government, better locations. In Figure 4 the factors are summarized which determine how strong the competitive pressure related to the threat of entry is. The major focus should be on substitutes which are getting more attractive in comparison to the industry product and where the producers achieve high margins. Scouting the market and identifying trends early can give alternative ways in acting. For example: to try a strategy to tackle the product or consider it as a new competitive factor. 1. Supplier group is dominated by few suppliers which are more concentrated as their costumer industry. 2. Supplier group does not have to deal with substitute products. 3. The industry is a relatively unimportant costumer to the supplier group. 4. The products of the supplier group are important and necessary factors to its costumers. 5. The supplier group products are differentiated or switching costs are created. In figure 6, the factors which determine the strength of the bargaining power of suppliers are listed. 1. Group is concentrated or purchases large volumes relatively to the seller sales. 2. The products which the buyer group purchases from the sellers are a huge fraction of the overall buyer costs or total purchases. 3. The seller products are standardized or not differentiated. 4. The switching costs are low for the buyer group. 5. The buyer group is able to threaten the sellers or suppliers with backward integration. 6. The quality and performance of the seller product is not important to the product produced by a buyer group. Figure 7 lists all factors which determine whether the bargaining power of buyers is stronger or weaker. The government is another factor to consider in the structural analysis. Since the seventies and eighties the government is affecting every competitive force. The government can be a supplier (for example supply of raw material) and a buyer (for instance military vessels). The government can influence the entry barriers (for example by customs), the rivalry (by for example regulations with regard to cost structure or influence on growth) and even substitute products (by laws, subsidies and regulations). For the structural analysis it is more useful to identify the impact on every single competitive force instead analysing the government as its own competitive force.34 With the identification of the forces and the underlying causes it is possible to draw conclusion with regard to the position of particular companies. For the analysis of the industry it is important to watch were an industry is in its life cycle. But there are also other factors which need to be identified. These factors driving industry changes and changes in industry condition more. Because key forces are driving the market participants to change their actions; “…the driving forces in an industry are the major underlying causes of changing industry and competitive conditions - they have the biggest influence on how the industry landscape will be altered…”35. Step 1: Identifying the driving forces. Step 2: Assessing if the driving forces are strong enough to change the attractiveness of the whole industry. Step 3: Determining the strategy changes which are needed to prepare for the impact of the driving forces. The last step is necessary for analysing the macroenvironmental condition for a specific company. In the Thesis the last step for analysing the macroenvironmental conditions of the whole industry will be not applied. 2. Increasing globalization: As soon as market members starting to look for customers in foreign countries or production of companies moving to countries with lower wages, the competition begins. Globalization of competition really starts if one or two market participants seeking for the world wide leadership by expanding into more and more countries around the world. Globalization is ramped up by reducing trade barriers between different countries across the world. Further, the significant differences in labour cost around the world are a big incentive to spread the operations of a company and transfer production to countries with lower labour costs. In industries like cell phones, digital cameras, computer equipment, motor vehicles, steel, video games, public accounting, textbook publishing, globalization is a major driver of industry change. 1 cf. APuZ (2011), p.12, p.15 cf.